The fist clue for frame 8 is posted, thanks to Sayid'sgirl for letting us know. LotteryTicket emailed first that the image on the DCaaPB site is from the prints page on the DGPH website. This looks like something I may have seen on TV while babysitting my 4-year-old nephew. I guess I can't call his parents so I can ask him about it until later (it's 3am here right now)! this looks like some graffiti street art O.O probably a city somewhere? Could the 1st reveal be out of order? When saving to file, the name is F8Picture2. Mistake or intentional? This looks really familiar to me, can't place it though. Yes it looks very familiar to me to, but I can't quite place it. Also be careful searching on the web for "Pink Monster" ! Picture 2 does seem odd, perhaps the first clue wasn't deemed suitable ? LOL. Before I read your warning, I carelessly searched for "Pink Monster Images". Yikes! I've been searching for purple monster with horns - to no avail. It reminds me of a computer game cover for a Nintendo Wii title. The black stripy thing in the top left kind of looks like a guitar fretboard. On the other hand, maybe it is not a Pink but Magenta Monster… like T-Mobile! I'll chime in, it looks familiar to me too. My first thought was Powerpuff Girls too. I agree I think that's a skyscraper. My daughter spent the night with her friend so I'll have to wait to ask her. She might know. Just out of curiousity ellen, does your email say? just kidding, I see your "email" comments every so often and I had to say something. I know I have seen this image in the past 2 months. just cant remember where. maybe we should check the gallery artists too? It totally reminds me of Adult Swim. I cannot see how these artists would not be friends with William Street. Anb I would totally be over-juiced like Crank 2 if Doc Hammer got involved. I don't know how many other incarnations of "pink Yeti" and "cartoon" I can search for. LOL. It looks like tokidoki, pretty sure it is, google it. cant find the monster yet though. but i bet its near by. well after looking around a lot of artists use that style lol. might be more around the skateboarder graffiti area. But it was a start. definitely not powerpuff girls lol kidrobot is another person that does that kind of art. can always find similar stuff at urban outfitters as well. Saw this clue before and during falling asleep. disturbing. yet familiar. I tried 'horned' and 'viking' last night. So glad I did NOT find whatever zort70 did. Looking at it again, it seems that the monster's head is on fire (or smoking) it may be that someone, or something, else in the cartoon is electrocuting or firing a ray gun at the monster. I never saw it..and for the life of me I can not find a pic of it,,so I will ask,,could this be The Purple Buffalo from an episode of the TV animated version of The Never Ending Story that ran back in the 90's?..or maybe an Qlympic Mascot?..sport team mascot? I spent last night looking through the artists that have created Dunny's for Kid Robot and that didn't work out. Something I pointed out in the last comment thread: it looks like the lower left is a little darker than the rest, as if this was a picture taken of an object angled away from the picture. And yes, Doctor Hammer being involved would be awesome. I think the object next to the 'monster' is another larger 'teammate' that is kicking up smoke? then there are those trees on the bubble? or we are in the clouds? Still see everyone is is perplexed like a few of us were last night! I see a purple flaming monster with horns. Tried all variations of that and got nowhere. The thing on the left definitely looks like a skyscraper to me. I know I have seen it recently, I took note of the "crumbs" around the mouth, pits, and horns. I am just drawing a blank. Going to pound beer after beer in an attempt to recreate the conditions by which I might have seen the image. back with resplendent spelling errors when correct mental state achieved. getting closer to potential rememberance of the image, or closer to the cooler, not sure which. Why give us the artist before the location? I know it breaks the pattern we've seen so far but perhaps this is a clue about the artist? ...Or maybe this is another artist's work and the print URL will be released somewhere where this is on display? Like a gallery or vinyl toy store that also displays/sells art? I checked KidRobot and they have some toy release events next week in a few cities but I'm not sure there's a connection. Though there is heavy use of pink in the "Buff Monster" toy event ad. ...ugh... I should read up before I post lol. 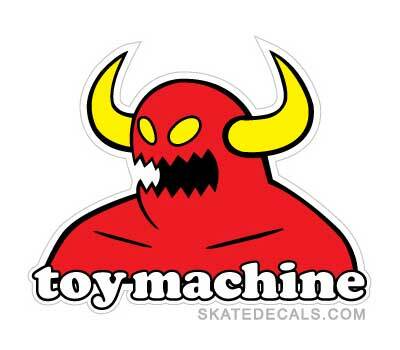 I brought up the toy machine link last night. There's something else the monster's face reminds me of, but I need some help placing it. Nike was running some print ads maybe a year ago (especially in comic books) that had these little orange blobs, and from what I remember, their eyes were similar to this monster's eyes. But I can't seem to track those ads down. Does anyone else remember them? I'm googled out. Seen monsters, vikings, puppets, cartoons, & things that I hope to never see again. :) Time to enlist a little help. Thinking of posting image on my FB page to see if friends have seen anything like this in their travels. Of course they'll have no clue as to why I'm asking. JPL: I already did that last night. None of my circle of friends helped us out! Maybe yours will! The character is a bit reminiscent of Domo Kun. The eyes and teeth/mouth in particular. Though I highly doubt this has anything to do with Domo Kun. I think I found out who the artist is-- DGPH. Then click on "Happy Villains" on the RHS. And check out the 1st & 2nd images from the left. It definitely looks like something that I have seen on Adult Swim, so whoever said that good call because that is why I think it is so familiar. My gf said it looks a lot like Domo, just not brown. Justanothersky: Cool...sure looks like this could be it. How did you find that? 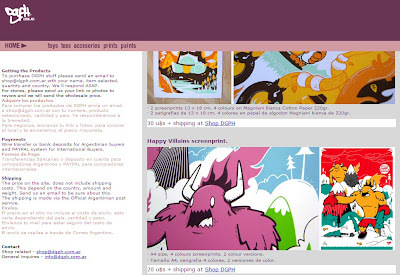 Check out under "Screenprints"...it's there!!!!! That thing on the left turns out to be another mountain! Great job justanothersky!!!! It's the exact full image! 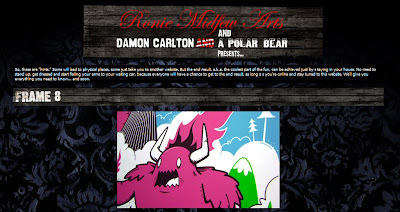 Definitely the right artist, I have found a picture of the same alien / monster on another print. @justanothersky- you are today's Sherlock Holmes! Great job! Now what does this mean???? Went to his site, found those drawings almost straight away. 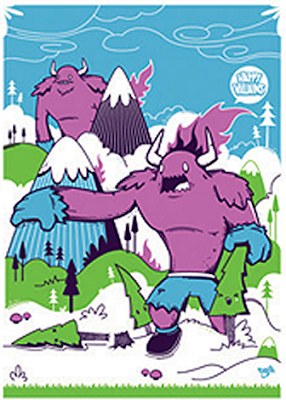 Under 'Works' There is a larger print of this monster, maybe a pink yeti, and the lines are of a mountain. In Molestown, play through it enough to find contact info. So does it mean this time the venue is a toy store? Or Gallery1988? The latter is less likely though, IMHO. Great work justanothersky, awesome detective work. First thing I thought of when I saw the "Happy Villians" was...Ben poster? That would be cool. Mr Flames and the Fire kid live in Molestown deeps, a few miles beneath the ground. Mr. Flames tries to rise(sp) his kid, teaching him the family business in the future,: the volcano heat factory. But Fire kid, wants to be professional swimmer, which creates a big discussion at dinner time, Someday Mr Flames will understand and will let his kid fulfill his dream. Just want to clarify-- by toy store, I mean those selling collectors' toys like limited edition Kubrick / Bearbrick, along with comics & things. After all, there is a whole LOST collection by the Kubrick people. i was in Cult this morning just couldn't see it. knew it was familiar. so Happy Villians. Why are they so happy? Because they invading? Killing trees? Flickr, shows the connection to Nike which someone suggested earlier (sorry not to find your name). use "Tags" to see 'villains' which will take you to another link to Happy Villians poster release. Yes, Capcom! That's it! Do you think this artist was used for the Slusho stuff? Thanks LotteryTickets for your link. In that photostream, there's a photo of DGPH's prototype figures in SDCC 2009! Then from there, I found the exact name of the booth it appeared. That then led to a toy store / gallery located in LA-- "Munky King". Probably way too early, but could "Munky King" be the next venue? "Tsuchi is Father Earth, the oldest god and wisest being that has ever lived. Seated on his throne in the planet's core, he rules the seas and the land, surrounded by his little minions. His upper half controls all the nice good things that happen in the world, while his bottom half rules the mysterioius dark side. The energy caused by the friction of his internal struggle keeps the planet on its rotation. As long as both sides keep up the fight, life will continue its natural course." Interesting that the first clue is of a particular artist. Usually it's leading us to a location. Looks like this is the actual image used for the clue. Something I noticed when the first clue went up this morning... maybe it's out of order. When saving to file, the name is F8Picture2. Mistake or intentional? Has anyone mentioned that DGPH has a booth at this convention this weekend in Argentina? Could they do the link reveal all the way down there? Thanks AndyShex and LotteryTicket (via email), it's on the Prints link on that page. The one I posted on the main site is from another copy of it, but you have both found the original. If they do it in Argentina, my guess is that it'll also be a Twitter thing, in case no one shows. MEL can i live in your world, plz? Isn't Fair Winds a translation of Buenos Aires? Wow. Would be awesome of the creators to do an event in Argentina for fans down there. I need to find my high school Spanish teacher and thank her! DGPH, the designers of the Happy Monsters image is releasing the book "The Ark Project" at a event in Buenos Aires. Website says 10/2, 3 and 4 -- could the event POSSIBLY be tomorrow? That would be fast! I can't take the credit - I first saw the book info on a post at SpoilerTV from Dohill06. I don't think we ever have to worry about a "fan" needing to be at an event to get the website info revealed. Say...Nobody showed up at the Crumbs event in NYC....not one LOST fan made the trip there. I'm certain someone who WORKS at Crumbs was instrucked to take a pic of the website on the back of the jumpsuit and then e-mail it to TPTB for posting. I'm fairly certain there is always a contengency plan in place if no fans show up...besides Twitter. If this Frame 8 event is truly located in Argentina (altho, I'm sure there's LOST fans there, too), and no one shows up for it...I'm sure someone at DGPH has been instructed to take pics of the reveal and forward them on. @Chief Brody - I agree with you. The photos of Crumbs at DCAAPB were not taken by fans, but with someone from ABC who came into the store after we were all gone. However, when we do have "correspondents" there, the website gets to us between 10 and 30 minutes before the website goes on the hub. No real advantage other than fun. Yes! Great work figuring this one out, gang! A new clue for frame 9 has been posted.